With projects, that is. Seems like when I finish one, I start 3 -- or 4 -- more. Good way to keep from being bored. 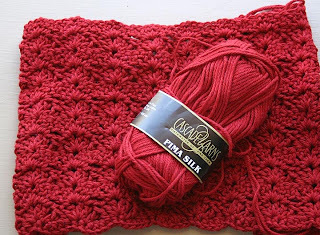 Project #1- baby blanket to be gifted in October. Two strands of baby-weight yarn held together, worked with a "J" hook. Love this ripple pattern. Still debating whether to put a big, fancy border on here or go with something simple. Probably decide based on the amount of time I have to meet the deadline. I'm really pleased with this new pattern from Patons Yarn. 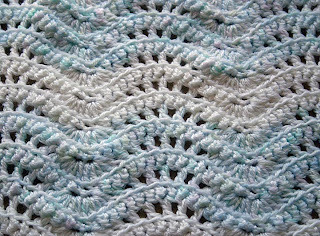 It's an true intermediate-level pattern, with side-shaping and lots of other goodies. I'm glad there are lots of easy patterns out there for beginners; but it's nice to have more interesting/challenging patterns for the rest of us. So thank you, Patons! Project #3 - a sweater for me. I've had this pima silk yarn in my stash for awhile, and I put this sweater in my Ravelry queue over 8-months ago. Finally put the two together. Since I'm getting gauge exactly, it was obviously meant to be. It's a very traditional cardigan design, which is exactly what I wanted.